Whether you’re directly in the front of the stage, in the midst of a chaotic mosh pit or even sitting in the nosebleeds, Houston rapper Travis Scott doesn’t fail to get you hyped. Fresh off the release of his most anticipated and third studio album “Astroworld,” Scott’s “Wish You Were Here” tour brought together his longtime fans and newcomers for one night of ultimate raging on Nov. 27 at Madison Square Garden. “Astroworld” has been in the works ever since Scott dropped what many fans consider to be his best album, 2015’s “Rodeo.” Scott said in an interview just before “Astroworld” was released, “I’m just finishing the saga I started on my first album. This is supposed to be my second album.” Scott was rumored to drop “Astroworld” after it was announced in 2016, but he instead released “Birds in the Trap Sing McKnight” the same year. Finally, after three years of waiting, “Astroworld” was released on Aug. 3, 2018 and a tour was announced mere weeks later. With openers like Harlem rapper Sheck Wes and Atlanta rappers Trippie Redd and Gunna, fans knew that every concert on the tour was going to be a thrill. Scott has always said that “Astroworld” was inspired by Houston’s Six Flags Astroworld, the amusement park that was closed down in October 2005. To bring the feel of an amusement park to the concert, Scott had two roller coasters built for the tour — one on the secondary stage and one above the mosh pit. Fans were able to ride the roller coaster at random points throughout the show. The openers helped get the crowd going for Scott’s set. Wes performed cuts off his album “Mudboy” before ending with one of the biggest songs of the year, “Mo Bamba.” Trippie Redd played several songs, including popular song “F**k Love” with the vocals of deceased Florida rapper XXXTentacion blaring through the arena. Gunna was the longest opener, playing a majority of his recent hits while bringing out frequent collaborators Lil Baby and Young Thug to perform several songs as well. 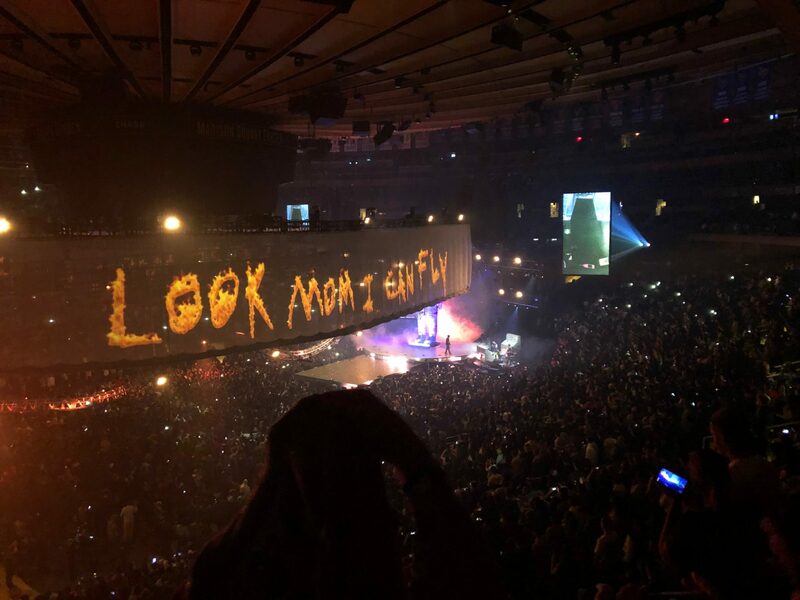 A three-minute futuristic video opened the concert with some songs off “Astroworld” playing in the background. Once over, the beginning of the album’s first song, “Stargazing,” hit the speakers. Scott sang to the audience that he was behind them before appearing on the secondary stage as the beat dropped, ensuing chaos throughout MSG. Scott had ultimate control of the crowd, whether it was screaming “bounce” over and over again as lights and speakers rocked MSG or getting the crowd to sing some of his most popular songs in unison. He is known to accept fans on stage, even if security tries to stop them — Scott will often let them up himself. His only rule is that stage diving is the only way to get off the stage. Scott has a tendency to bring out special guests for his shows; but, for the Nov. 27 show, he was the lone superstar. For every show on the tour so far, he has brought out fellow Houston rapper Don Toliver and one of his opening acts, Gunna, both of whom are featured on “Astroworld.” Scott has brought out the likes of Drake, Kendrick Lamar and Young Thug during other stops of the tour. As the concert came to a close, Scott took a few minutes to thank the crowd for sticking with him since day one and for being patient while he worked on “Astroworld.” He continued to push people to stream “Sicko Mode,” which currently sits at No. 2 on the Billboard Hot 100. He went on to ask the crowd to rage one final time for the night just before the horns to “Sicko Mode” played over the speakers. Every single person jumped up and down throughout the arena as Scott ran around the stage — shirtless — screaming the lyrics into his mic. However, he was barely heard over the crowd, who was singing at the top of their lungs. The show ended with a mini fireworks display before Scott descended below the stage one final time — not before thanking every fan for coming to Astroworld, capping off a night of pure adrenaline, excitement and rage.